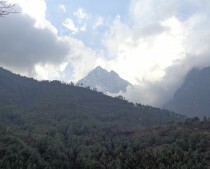 Our first few days in Kathmandu were spent sight seeing, getting to know Nepal and spending money on last minute gear. We visited Pashupatinath and Bodhnath (or at least, according to my itinerary we did, couldn’t for the life of me tell you the names of the actual places we went to, sorry!). We did visit many big and small stupas, witnessed a cremation (I felt very intrusive doing this) and baked in the midday heat. The most exciting moment was when our bus took down a telephone pole and we pretty much caused a major road block at a busy intersection. Pesky tourists! And in the true tourist form, we disembarked, took some pictures and walked away to another location where a second bus came and picked us up! 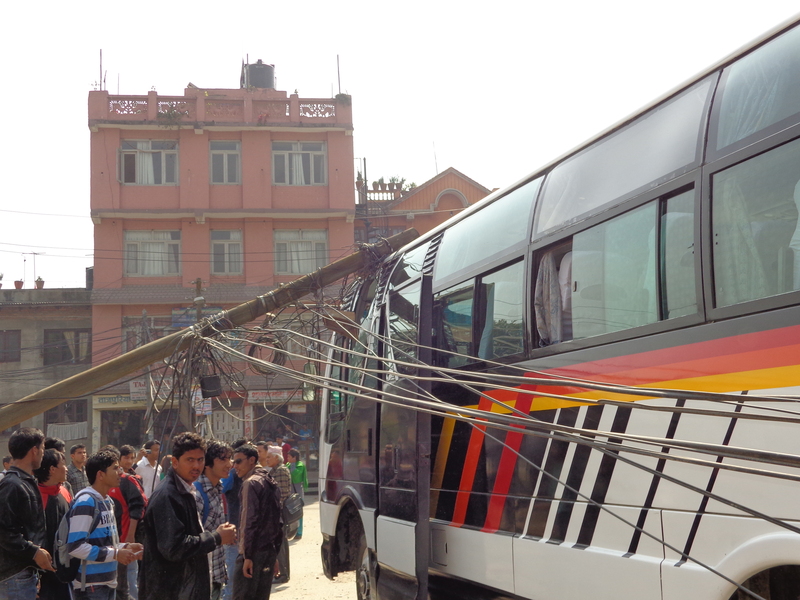 Bus vs Telephone pole. The bus won. The walk was fun though. 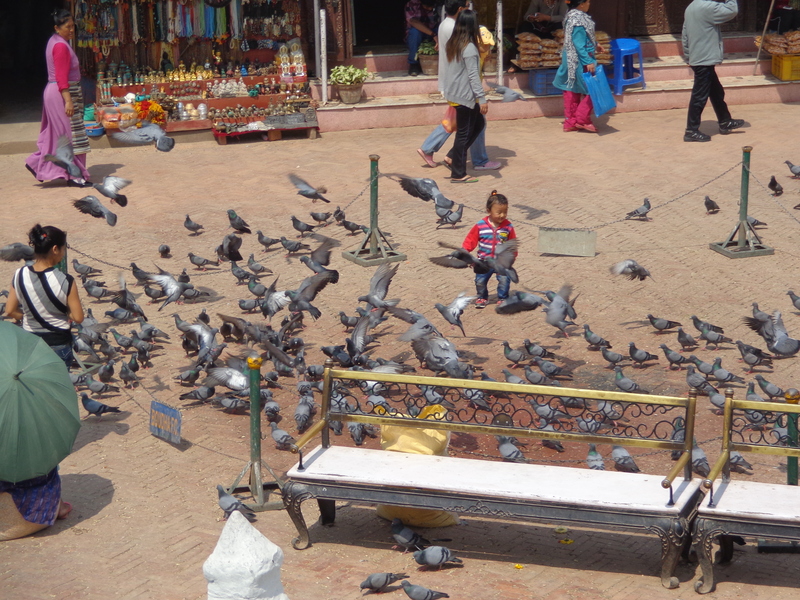 It was the first opportunity to really get a feel for Kathmandu. Busy but not too busy. Hectic driving, an adventure crossing roads and lots of little children trying out their English on us. One lady who was selling some goods tried to shoo us away from her corner, clearly us waiting there was cramping her style. The smog and dust are two of the main things I’ll remember about those first few days. Many people wore make shift masks and I would later realise just how useful those masks would be. I managed to pick up a major dust cough (which probably became more) that worsened my breathing the higher we went, and still hasn’t quite cleared. I even learned how to spit the Nepalese way! (with much apologising in between). We dined at traditional touristy Nepalese place (i.e. definitely very expensive) but were privy to some local Nepalese music and dance. Although sitting on the floor was a cool and novel idea, it caused significant problems for the taller members of the group! I think those initial days we were probably just keen and apprehensive to get going. 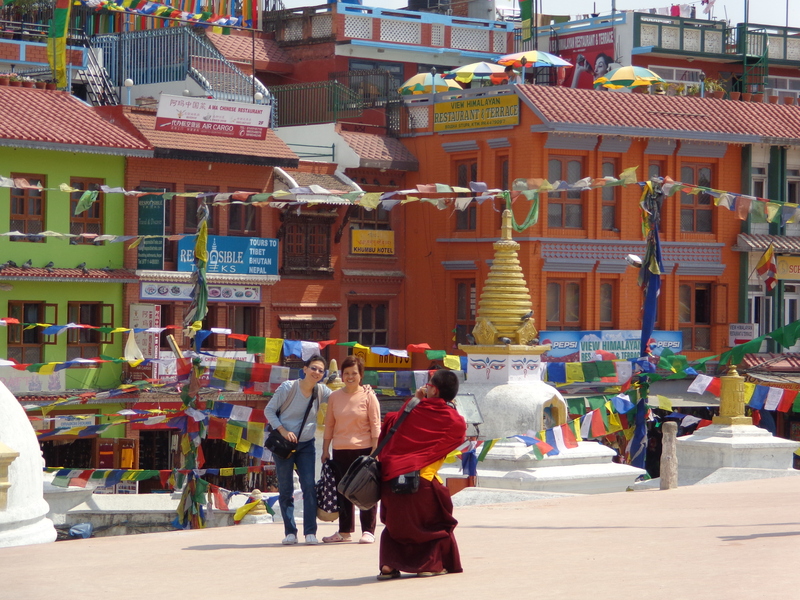 I don’t recall much of a good word being said about Kathmandu, perhaps it was not what we were expecting (greenery, hills, calm serenity) but I do think the days we had on return were much more enjoyable. At this stage however, we were just keen to get going and acknowledged that it was really just a way to buffer any problems in the itinerary (like snow days, for example!). One more thing to note was the river. It was used, as most rivers are, as a source for everything and a dumping ground for everything. There are wells for clean water, and shallower regions for scattering ashes. It was definitely not clean and I think the fact that it was used for so many differing purposes made it a little sad. Surely someone was drinking bad water? But I enjoyed the religious tolerance they exhibited, sharing Hindu and Buddhist traditions and celebrations together. And as I mentioned before, the Buddhist undertones were everywhere. I think I loved this the most. If I could choose to be something, I would definitely choose to be Buddhist.